HANOI, VIETNAM – 29 January 2013: ICEM in partnership with WorldFish has been awarded a project from Cargill Foundation to study Mekong fish migration and hydrology, to inform the sustainable design of fish passes for proposed hydropower projects. The USD 580,000 study represents the first ever scientific assessment of the hydro-geomorphic conditions of fish migration dynamics on the Mekong River. Fish migration routes will be dramatically impacted by the intensive development of hydropower dams across the Mekong. With 72 hydropower dams expected to be operational by 2030, 81% of the fish migration routes could become impacted or blocked. This could isolate migratory fish from their breeding grounds in the upper reaches of the Mekong and the rich feeding habitats of the Cambodian and Vietnamese floodplain – with drastic implications for food security, livelihoods and biodiversity in the Mekong region. The Mekong River is the world’s largest inland fishery – sustaining some 40 million people. An average of 2.1 million tons of Mekong fish is harvested each year (Hortle 2007, ICEM 2010), providing 81% of Cambodians and 48% of Laotians with their protein requirements. Fish migrations are central to the productivity of the Mekong system. There are 165 long-distance migratory fish species here, which represents more than 770,000 tons of fish per year. Recent hydropower developments in Lao PDR and Cambodia have fueled economic growth, by supplying the demands of China, Thailand and Vietnam. But designing sustainable fish passes is a crucial component of these hydropower dam projects. In response to the issue of migratory fish, hydropower developers have identified fish passage facilities as one of the main mitigation measures in place at dam sites. However, the designs of these proposed fish passes are not backed up by studies of local species and of their swimming capabilities. Existing fish passes often don’t work or only allow fish to pass under certain conditions. With the introduction of 12 hydropower projects for the mainstream of the Mekong River, including the controversial Xayaburi project, there is an urgent need to improve understanding of the natural migration systems of Mekong fish. 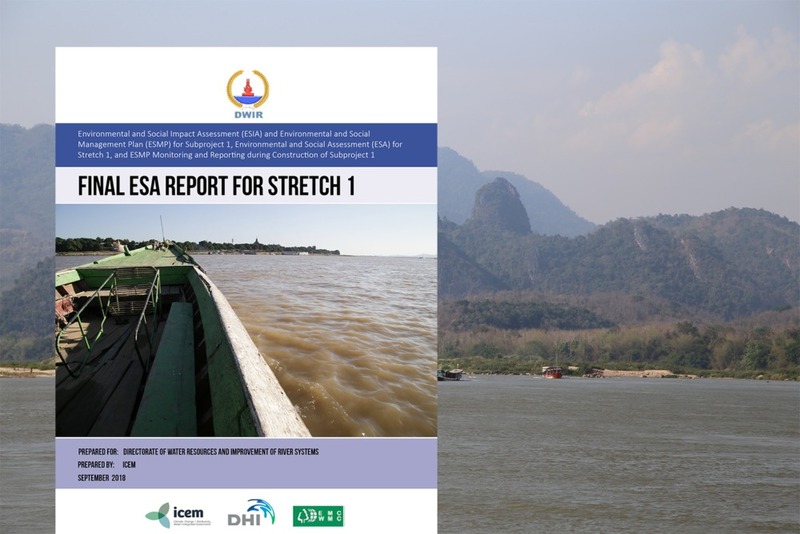 This is a crucial the first step towards understanding the hydrobiological requirements for Mekong fish passage. Through this new project, ICEM in association with WorldFish Center, the University of Udon Ratchathani, University of Savannakhet and National University of Laos will assess fish swimming capabilities and the hydro?geomorphologic requirements of fish migrations using the Khone Falls, a waterfall located in Champasak Province on the Mekong River in southern Lao PDR, as a natural laboratory. The channels of the Khone Falls contain a large variety of hydro-morphological conditions which fish different species use under different water levels. This provides an ideal natural testing ground for assessing the optimal condition for passability; the capacity of a fish pass to foster the passage of all species without stress and injury, and traceability; the success with which fish can find the entrance to the fish pass. The flow velocities, flow pattern, turbulence level and flow discharge are crucial components which will also be measured throughout the study. This significant study is the first of its kind for the Mekong River and will provide the foundation for understanding fish migration dynamics to inform realistic and sustainable design of fish passes for proposed hydropower dams. The next step of the project will be conducted at the end of the rainy season when fish will migrate (September 2013). Comprehensive assessments will be made of fish migration movements, along with measurements of flow velocity in different channels and gradients. The study will combine scientific field work with community survey and consultation techniques, to gain an in depth understanding of Mekong river fish migrations and the impact on communities in the Mekong basin.